Hey, just because we cannot have Bulgur Wheat, we can still enjoy a lovely refreshing Tabbouleh! And it is also less calories too! 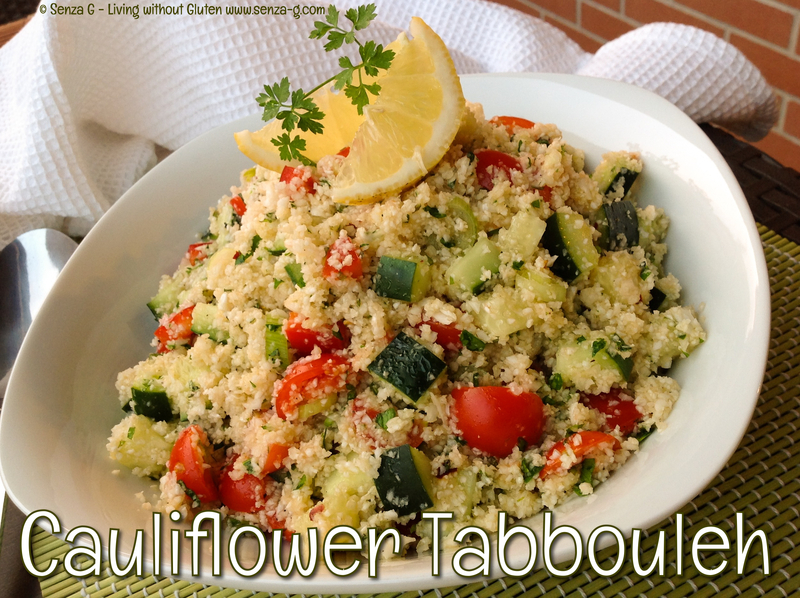 Try this Tabbouleh version. Hope you will like it. It is perfect Summer Fare! Break the cauliflower into big chunks and put into a food processor along with the mint, parsley and garlic. Pulse several times until minced. The cauliflower will have a granular texture just like couscous. Set the cauliflower aside in a big bowl. Chop the tomatoes, cucumber and onions. Put the tomatoes in a colander to drain excess juice. Place the chopped vegetables in a mixing bowl or dish. Add the cauliflower couscous and season with salt and freshly ground pepper and chilli if using. Mix gently. Add the the lemon juice and olive oil and mix again until well combined. Check seasoning. Chill before serving. Garnish with Lemon quarters.